The Environmental Literacy Center (ELC) is admistered by the N.C. Office of Environmental Education and is located within the Museum of Natural Sciences Nature Research Center in downtown Raleigh. We have 2000+ holdings of books and DVDs such as educator guides, environmental curricula, North Carolina field guides, naturalist books, environmental non-fiction and children's books. Subject areas include environmental science, popular natural science, conservation, sustainability, museum and non-formal education practices and science education. The ELC is available for use upon request. It can be used as a meeting center and/or a resource center for individuals or groups in the field of environmental education. The resources can be used by educators and preservice teachers or for student research but the holdings are only circulating for DEQ employees at this time. The center has internet access, a large HDMI monitor and a LCD projector can also be provided upon request. The Center can hold groups of up to 25. To request an appointment, contact Lisa Tolley at lisa.tolley@ncdenr.gov or 919-707-8125. The ELC is located on the 3rd floor of the Nature Research Center, down the hall from the Micro World Investigate Lab. The room number is 3512. The Office of Environmental Education and Public Affairs hosts a guest lecture series called the Lunchtime Discovery Series. Professionals from a wide range of environmental backgrounds come and give presentations about their work and offer an opportunity for attendees to learn about a variety of subjects during the lunch hour. 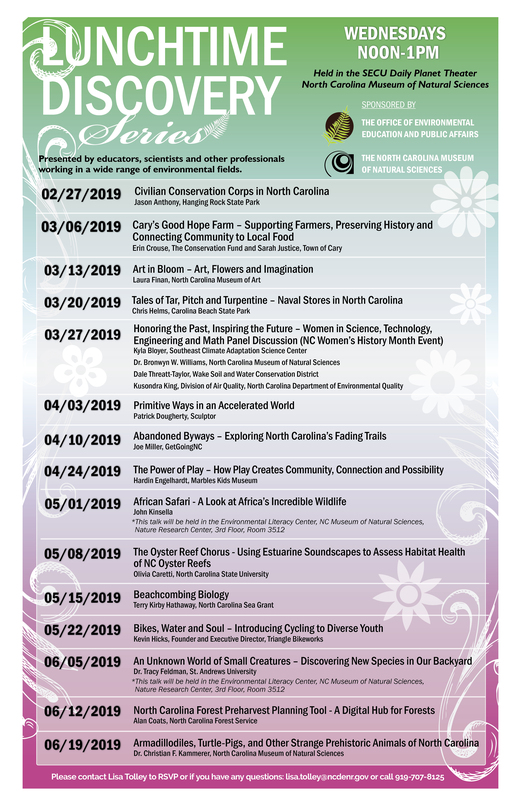 Topics range from spider diversity in North Carolina to Geographic Information Systems (GIS), to how to incorporate music in environmental education programming. Several of these presentations are archived on our site. Our resources are catalogued through the State Library of North Carolina.